The Hulk didn’t appear in Avengers: Infinity War after its opening scene as the Jade Giant refused to come out and help Bruce Banner fight the Outriders after he was brutally beaten in a brawl with Thanos. Merch has confirmed that “the other guy” will definitely re-emerge in this month’s Avengers: Endgame, though, so Banner and Hulk must come to some sort of an agreement in the movie. The common theory is that Endgame will introduce Professor Hulk into the MCU for the first time. As the name suggests, this is the merged being in the comics that has Hulk’s brawn but Banner’s brains. 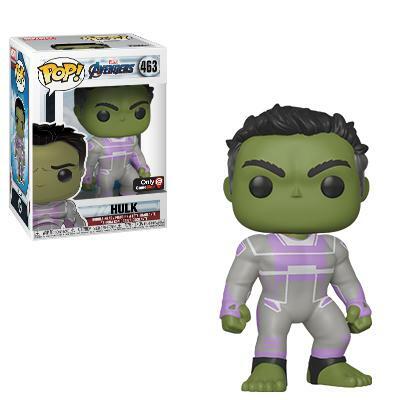 There’s been a lot of evidence that this version of the character could be coming soon and the latest is one of Funko’s range of POP! vinyl figures. Adapting Professor Hulk in Endgame – even if he might go by Smart Hulk instead – makes a lot of sense, as it’d be a natural culmination of Banner’s arc across the MCU so far. Not to mention that we’ve also been promised that Endgame will wrap up a loose arc that’s been building across his past three movie appearances – this, Thor: Ragnarok and Infinity War. It’s unclear if Mark Ruffalo is packing away his purple trunks for good after this, but it seems that the curtain’s closing for many of the OG Avengers – except Black Widow– so it’s a definite possibility. Either way, though, all will be revealed when Avengers: Endgame hits cinemas on April 26th.